Study Reveals 2016 Is "The Year of Cold Brew Coffee"
NEW YORK, NY--(Marketwired - Dec 12, 2016) - After more than 12 months of headlines featuring food safety issues and efforts to win back its customers, Chipotle's Recovery Efforts ranks as 2016's No. 1 food news story in the Hunter Public Relations annual Food News Study. Hunter Public Relations, one of the nation's leading food and beverage marketing communications agencies, has annually commissioned a study to determine the top food news stories of the year since 2003. For the past four years, the study has been conducted in partnership with Libran Research & Consulting, which surveyed more than 1,000 Americans and asked respondents to select the top three food stories of the past 12 months. "Our annual look at the top food news provides us not only with a great window of understanding into what is rising above the noise to engage consumers, but also how that news has potentially impacted their behavior and which food media outlets they turn to and trust," said Grace Leong, CEO of Hunter Public Relations. "In an election year when the noise has perhaps never been louder, it's interesting to note that 76 percent of consumers still find information about the food we eat to be 'important,' and 41 percent 'somewhat' or 'much more important' than any other news." Chipotle's food safety issues began making major national news late in 2015 and continued in 2016 when norovirus affected more than 200 customers in the Boston area. In an effort to win back the public's confidence, Chipotle hired a food safety expert who implemented new procedures, protocols and preventive measures that were broadly covered in consumer media as well as touted in full-page newspaper ads in September. Overall, news related to the eating out experience continues to trend upward in the annual survey. Five years ago, such stories only occasionally made the top 10 list, but both this year and last, three of the top 10 stories (including the No. 1 stories) relate to eating out. This year, beyond Chipotle, the expansion of "No Tip Policy" Restaurants ranked No. 5 while Restaurants' Marketing Efforts to Capitalize on the Pokémon Go Craze scored the No. 6 slot. Americans continue to rank food safety stories high in the survey, and the topics of food safety (53 percent) and nutrition (47 percent) continue to be most important to Americans. In addition to Chipotle's recovery taking the No. 1 spot, Listeria Outbreaks -- highlighted by an outbreak from a processing plant in Washington state that affected frozen fruits and vegetables marketed under 42 brand names sold in all 50 states -- came in as the No. 3 food news story of the year. At No. 4, President Obama signed the GMO Labeling Bill that created a federal requirement for labeling products made with genetically modified organisms (GMOs) that supersedes tougher measures passed by one state and considered in others. While winning over some food-labeling advocates, others criticized the bill because food companies can use QR codes or toll-free numbers as a form of GMO labeling, making it harder to obtain the information. GMO-related stories have ranked high in the survey nearly every year since 2012. At No. 7 are the efforts by the FDA to Redefine "Healthy," now underway to create a new definition of the word -- which is a nutrient content claim -- that can be used on food labels. The FDA noted that "public health recommendations for various nutrients have evolved" and the term 'healthy' has not necessarily kept up. At No. 9 is the news coverage that the FDA Approved A New Nutrition Panel that Highlights Sugar. In the first major overhaul of the nutrition label in more than 20 years, the FDA added a line that calls out added sugar, where previously it only listed total sugar. The Honey Bee Decline, which was the No. 2 story in 2014, buzzed back into the survey's No. 2 slot in 2016. This year, for the first time ever, the U.S. Fish and Wildlife Service added seven bee species native to Hawaii for protection under the Endangered Species Act. Clean-Eating & Labeling took the No. 8 spot as demand for 'clean' eating has spurred the use of "pure commodities," meaning whole food ingredients consumers can readily recognize in packaged foods and drinks. Finally, the Sugar Industry Pointing Blame at Fat rounded out the survey in the No. 10 spot. Historical documents from the 1960s surfaced this year showing the sugar industry paid scientists to play down the link between sugar and heart disease, and instead promote saturated fat as the culprit. In a new twist on food "news," this year's study also asked Americans what they considered to be the food or drink of the year. Cold brew coffee came out on top, and was the frontrunner across most age groups. Avocado was a close second, and also making the list were turmeric, doughnuts and coconut. This year's study confirms that Americans are taking action as a result of the food stories presented in the media. In fact, more than half reported making a specific behavioral change in how they shop, eat or dine out as a direct result of food news consumed. While the majority of consumers reported the widest behavior changes related to the No. 1 and No. 2 stories, a notable minority reported making changes based on food labeling news, specifically for Clean Eating and Labeling (No. 8) and GMO Labeling Bill (No. 4). Moreover, Millennials appear to be the generation most impacted by food media coverage -- with more than two-thirds of Millennials responding behaviorally to at least one story and almost one-third claiming to have changed their behavior because of the Chipotle E. coli recovery news. Consistent with previous years, specific behaviors influenced as a result of food news included reducing the consumption of processed foods (38 percent), and focusing more on food labels/ingredient lists (ranging from 34 - 38 percent). However, this attention to food labels has softened a bit in the last couple of years from a high of 50 percent in 2014. Eight in ten Americans have food-related New Year's Resolutions planned for 2017, with "trying to lose weight by eating better" (32 percent), "consuming less sugar" (30 percent), and "eating less processed food" (28 percent), topping the list. Last year, 19 percent of Americans resolved to cut sugar out of their drinks, while this year almost one-third want to work on their sweet tooth, suggesting a greater focus on reducing dietary sugar in the year ahead. The Hunter PR Food News Study expanded four years ago to delve more deeply into where and how consumers are accessing information about food, recipes and nutrition. Unsurprisingly, there is a continual and measureable decline in the use of traditional media such as television, print magazines and newspapers as a source of food information. Americans are turning to digital mediums including YouTube videos and podcasts, and social media platforms such as Facebook, where the impact of recipe videos can be seen. Videos posted to Facebook landed neck and neck this year with television cooking shows as a source for recipes, each at 17 percent. While websites are the leading source overall for recipes and nutrition, 46 percent of consumers still rely on television, including morning and evening news programming, to feed their hunger for general food news. This is tipped in part by Generation X, Baby Boomers and Matures' higher reported use of television. Millennials, on the other hand, uniquely report Facebook posts from peers and media publishers as their go-to resource for food news. When it comes to trust in food media, health and medical websites continue to win, with 91 percent of Americans in 2016 reporting those sites as the most trusted media source for food information, with Facebook posts from media (63 percent) and peers (59 percent) among the least trusted. For additional information about the Hunter PR 2016 Food News Study, including detailed study results, visit http://www.hunterpr.com/our-pov/foodstudy.html. Founded in 1989, Hunter Public Relations is an award-winning consumer products public relations firm with primary offices in New York and London and a footprint across North America. Beginning with research-driven consumer insights, Hunter PR executes strategic public relations programs that build equity, increase engagement and drive measurable business results for branded consumer products and services. The 120-person firm employs a powerful blend of traditional publicity, social and digital media, influencer engagement and events and experiences to reach the hearts, minds and spirits of target consumers. The agency is a member of MDC Partners Inc. (NASDAQ: MDCA) (TSX: MDZ.A), one of the fastest-growing and most influential marketing and communications networks in the world. 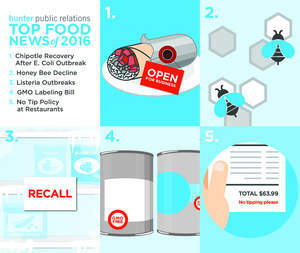 The 14th annual Food News Study commissioned by Hunter Public Relations examined the top food news stories of 2016 in terms of general awareness and concern. The study also explored how food news stories influence consumer behavior and the top media sources for food information -- broken out by recipes, general food news and nutrition. Hunter PR partnered with Libran Research & Consulting for this study. Libran Research addresses business issues with critical decision-making and impartial judgment -- helping to drive action in their clients' marketing strategies and tactics. Libran Research surveyed 1,046 Americans ages 18 years and older via an email invitation and online survey. The respondent sample was balanced to the U.S. population on key demographics. Results of any sample are subject to sampling variation. For the interviews conducted in this particular study, the chances are 95 in 100 that a survey result does not vary, plus or minus, by more than 3.1 percentage points. *The survey was implemented Oct. 24 to Oct. 28, 2016, covering the 12-month period from November 2015 through October 2016.